Sarah detoured into the tent, and Evie almost face-planted into one of its support poles. Strung crystals ringed it, glittering thorns on a wooden stem. Tiny lights, like tethered fireflies, twinkled across the ceiling. Sarah giggled, hiding her braces behind her fingers. Evie hated when she did that. Sarah dashed through a gauzy curtain and a beaded doorway before Evie could catch her. The candlelit room beyond exploded with color. Bright pillows cradled a woman in a dark blue caftan. An unnaturally red curl punctuated her forehead below a rhinestone-covered turban. It dappled the ceiling with the reflected light of fat candles scattered about the room. “I am Madame Irina. Come sit by me, dolls.” She patted a couple of overstuffed satin pillows in front of her. Sarah plopped cross-legged on the red one, bouncing on the cushion. Evie eyed the strange candles, the many open bowls of water around the room, and a statue of a cat that stared at the fraying hem of her jeans. She dropped to her knees on the green pillow and settled her hands atop her thighs, her sneaker clad feet curled under her. Madame Irina nodded, and her hands disappeared into the huge sleeves of her caftan, mirroring the frog meditating on the shelf behind her. The fortune teller remained silent for a long moment, and Evie realized they hadn’t paid her yet. Fortunes ten bucks, the sign outside had read. Madame Irina folded the bill, and reached behind her to place it in the frog’s lap. Sarah thrust hers out, the short rounded nails tipped a delicate pink. The fortune teller peered at her palm. “Details. Is he tall? Blond? A doctor? A lawyer?” Sarah nearly fell off her pillow as she leaned in. Evie’s stomach sank. She didn’t want to hear about the man Sarah would marry. “Now you, doll.” Madame Irina grabbed Evie’s hand before she realized it. 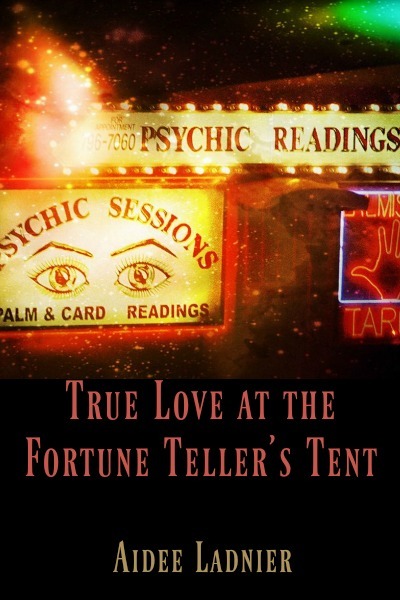 The fortune teller’s hot fingers clutched her hard when she tried to pull away. She opened her mouth to tell the woman off, but the fortune teller’s gaze slammed against the back of Evie’s skull. And Evie realized, she knew. The fortune teller knew about the carefully erased search engine history on her laptop. Of the growing realization that shook her shoulders and wet her pillow at night, though she denied it to herself each morning. Knew she had a crush on Sarah. That she wanted to kiss her best friend more than she ever wanted to kiss Danny or Eric or any of the boys Sarah flirted with at school. Madame Irina’s dark eyes crinkled at the edges. She turned over Evie’s hand and cradled it. Not husband. The fortune teller didn’t say husband … only love. And Evie ached for Madame Irina to speak, to soothe all her worst solitary fears. Madame Irina’s gaze pierced her for moment, and then she released her hand. The fortune teller never said “he will”, just “the one”. She kept her secret. Evie released the breath she held. “Don’t you want more? Like whether he has a big house or one of those ugly classic cars you drool over?” Sarah’s impatient voice startled Evie, and she jumped. “No.” She didn’t want anything to tarnish the warm feeling in her stomach … someday, someone would love her. “Well, I do.” Sarah turned her hard gaze to the fortune teller. “It’s not your fortune, doll.” Madame Irina’s eyebrow rose, and she drew her lips together like the drawstring of a purse. And the beaded curtain swung behind Sarah before Evie could rise to her feet. She looked at Madame Irina, unsure if she should apologize for her friend’s behavior or just go. The fortune teller’s eyes glittered and she tucked her hands back into her caftan sleeves. At first, the gravelly, nasal words didn’t register. And then she understood her fortune. The person she’d love. Was. Herself. No future girlfriend, no future wife, or even a future husband. She was the only person that would ever love her. She whirled to follow Sarah out, blinking at the stinging burn in her eyes. But as she pulled aside the beaded curtain, and Sarah called for her to hurry, Madame Irina’s hushed voice spoke behind her. And Evie’s heart swelled with hope.